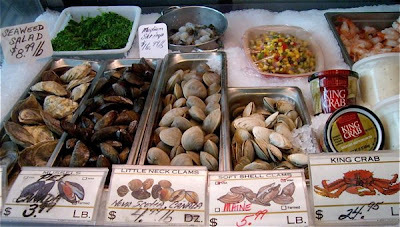 Look at this selection of delicious seafood for sale at Jake's Seafood in Hull MA. 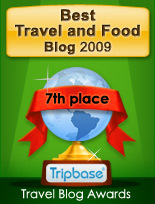 No wonder why New England is a Mecca for lovers of fresh fish and shellfish. Jake's Seafood is a shop and a restaurant specializing in seafood. On the image above you'll find what is available in the small shop of mussels from common clams and mussels to Little Neck and Soft Shell clams. Little neck clams are hard shelled, as their shells are firm and tough to crack, whereas soft shell clams have more brittle shells which are subject to breakage. However, that does not men that their shells are soft in the conventional sense. The Little Necks found at Jake's comes from Maine, whereas the the Soft Shells are from Nova Scotia. You'll get a pound from $3,99 to $6.99. To the right you can buy fresh King Crab meat, and it'll cost you around $25 a pound, but then you get meat only. It you picked out and sold the clam meat only, you would end up with a completely other price, maybe comparable with the crab meat. At Jake's you'll also find an abundance of fresh fish. From left you have fresh tuna, a species severely threatened by overfishing. 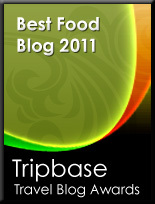 From the Grand Banks there are large steaks from another threatened fish - the swordfish. 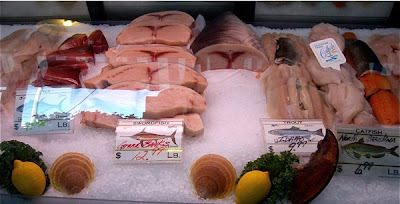 Both these are relatively expensive fish varying in price from $12,95 for swordfish, to $18,95 for a pound of tuna. The fresh water fish are less expensive. You can get trout from Idaho or catfish from North Carolina for less than $10 a pound.